Happy Valentine’s Day to you and your Valentine, whoever they may be. 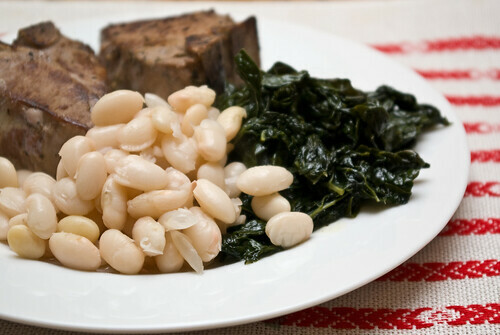 We celebrated last night instead of today, so I’d have time to cook up one of our favorite meals: seared lamb chops, garlicky white beans and a big pile of lacinato kale cooked in the bean liquid, risotto-style. For tonight we have a pot of soup that can be heated up when we get home – nothing fancy. What’s everyone else doing for dinner tonight? I’m having a yummy Hungarian beef-mushroom soup with my wonderful wife. That dinner sounds superb — I also love that you wouldn’t shy away from garlic on Smooch Day! My squeeze and I had a simple & fun meal Sunday night (chickpea veggie burgers and steamed veg), and went out on the town last night for cocktails at our favorite fancy bar (Bemelmans at the Carlyle Hotel) and then dinner at a casual, usual haunt. The perfect night to snuggle up to: A little bit glam, a little bit everyday. The key to eating garlic, of course, is for both people to have lots! Your Valentine’s outing sounds perfect.